Real live TV. Without internet. Watch live TV on your iPad and iPhone with EyeTV Mobile. Since the television signal comes from the attached telescopic aerial, you won’t need an internet connection or a Wi-Fi hotspot to watch TV. EyeTV Mobile never touches your data plan, so you can enjoy real live TV in brilliant quality without waiting for any data to load. Just visit the App Store, download the free EyeTV Mobile app to your iPad or iPhone, and connect the compact EyeTV Mobile TV tuner. Launch the app, choose a channel, and start enjoying live TV straight away. EyeTV Mobile is the only TV tuner of its kind to offer flexible antenna options. Position the telescopic antenna for great reception on the go, or connect the rod antenna in areas with poor reception – you decide. The proven MCX connector always ensures optimal signal transmission and prevents damage to the TV tuner or iPad or iPhone. Distractions? No problem. Pause the movie or TV show and rewind back to the part you missed. Effortlessly timeshift live TV on your iPad or iPhone with EyeTV Mobile. Want to record a show to watch again later? No problem. With EyeTV Mobile’s record function you’ll never miss a precious moment, even if the app is in the background. You can even use iTunes to transfer the shows you’ve recorded to your Mac or PC, or use AirPlay Mirroring to display them on your big TV screen. Convenient TV functions – no second screen required. EyeTV Mobile brings many more convenient functions to your the iPad that’ll make your traditional TV look like a relic from the past. You can email or tweet recommendations directly from the electronic program guide, surf the internet without losing sight of your favorite show, or use the teletext function to display the latest news or sports results. 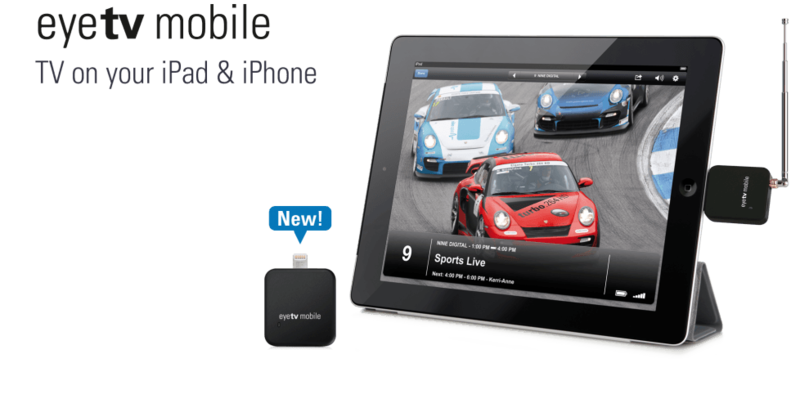 EyeTV Mobile turns your iPad into your TV of choice wherever you are. EyeTV Mobile works in Australia, Belgium, France, Germany, Great Britain, Italy, Japan, Austria, Poland, Spain, Switzerland as well as any country that broadcasts standard definition MPEG-2 or MPEG-4/H.264 video. High definition channels, encrypted programs and/or DVB-T2 broadcasts are not supported. The EyeTV Mobile app can display electronic program guide information transmitted in the DVB-T stream. The availability and amount of program information and teletext varies depending on the channel. EyeTV Mobile lets you enjoy up to 9 hours of live TV on your fully-charged iPad and over 4 hours on your iPhone (30% brightness, flight-mode enabled).